Calculate the work done by an 85.0-kg man who pushes a crate 4.00 m up along a ramp that makes an angle of $20^\circ$ with the horizontal. (See Figure 7.35.) He exerts a force of 500 N on the crate parallel to the ramp and moves at a constant speed. Be certain to include the work he does on the crate and on his body to get up the ramp. 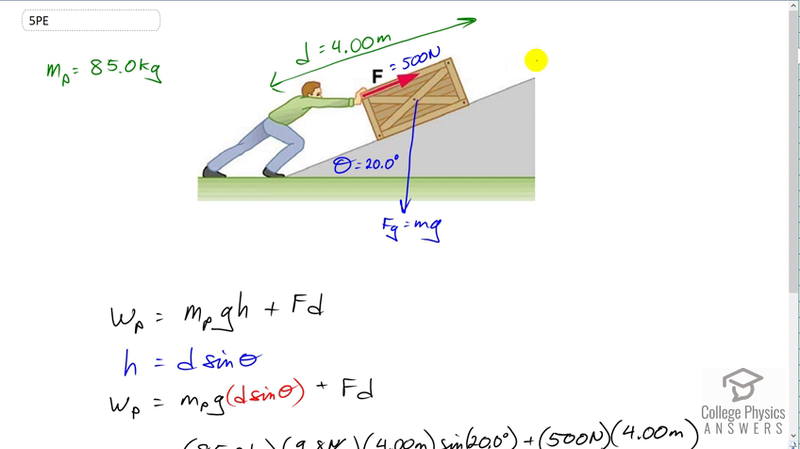 Figure 7.35 A man pushes a crate up a ramp. This is College Physics Answers with Shaun Dychko. We're going to calculate the total work done by this person in moving themselves up the ramp as well as pushing the crate up the ramp. So the work that they do to push the crate up the ramp equals the force they exert on the crate which is 500 Newtons along the ramp and then the displacement along the ramp. So that's this term here. Then the work that the person does on themselves is going to be their change in gravitational potential energy which will be their weight multiplied by their change in height and that is the vertical height that we're concerned with there. So the vertical height we can find by multiplying the length of the ramp by sine theta because we're looking for this opposite leg of this ramp triangle. So we substitute d sine theta in for h here, and we get the work done by the person is the mass of the person times g, times d sine theta plus the force exerted on the crate multiplied by the length of the ramp. So we have 85 kilograms times 9.8 Newtons per kilogram times four meters times sine 20 degrees, plus 500 Newtons exerted on the crate multiplied by the four meter length of the ramp giving us 3.14 times ten to the three joules of work done by the person.